How can a company do something remarkable that no one else is considering? The United States Postal Service — and an elevator company — provide examples of such success from shifting their customers’ actions. We continue our Leadership Hall of Fame series, a year-long look at the top business books and authors, with an excerpt from Purple Cow (2003) by Seth Godin. I don’t think there’s a shortage of remarkable ideas. I think your business has plenty of great opportunities to do great things. Nope, what’s missing isn’t the ideas. It’s the will to execute them. My goal is to make it clear that it’s safer to be risky–to fortify your desire to do truly amazing things. Once you see that the old ways have nowhere to go but down, it becomes even more imperative to create things worth talking about. Elevators aren’t a typical consumer product. They can easily cost more than a million dollars, they generally get installed when a building is first constructed, and they’re not much use unless the building is more than three or four stories tall. How, then, does an elevator company compete? Until recently, selling involved a lot of golf, dinners, and long-term relationships with key purchasing agents at major real-estate developers. No doubt that continues, but Schindler Elevator Corporation has radically changed the game by developing a remarkable Purple Cow. Walk into the offices of Cap Gemini in Times Square, and you’re faced with a fascinating solution. The problem? Every elevator ride is basically a local one. The elevator stops 5, 10, 15 times on the way to your floor. This is a hassle for you, but it’s a huge, expensive problem for the building. While your elevator is busy stopping at every floor, the folks in the lobby are getting more and more frustrated. The building needs more elevators, but there’s no money to buy them and no room to put them. The insight? When you approach the elevators, you key in your floor on a centralized control panel. In return, the panel tells you which elevator is going to take you to your floor. With this simple presort, Schindler Elevator Corporation has managed to turn every elevator into an express. Your elevator takes you immediately to the 12th floor and races back to the lobby. This means that buildings can be taller, they need fewer elevators for a given density of people, the wait is shorter, and the building can use precious space for people rather than for elevators. A huge win, implemented at a remarkably low cost. Is there a significant real-estate developer in the world who is unaware of this breakthrough? Not likely. And it doesn’t really matter how many ads or how many lunches the competition sponsors: Schindler now gets the benefit of the doubt. Very few organizations have as timid an audience as the United States Postal Service. Dominated by conservative big customers, the Postal Service has an awfully hard time innovating. The big direct marketers are successful because they’ve figured out how to thrive under the current system, and they’re in no mood to see that system change. Most individuals are in no hurry to change their mailing habits either. The majority of new-policy initiatives at the Postal Service are either ignored or met with nothing but disdain. But Zip+4 was a huge success. Within a few years, the Postal Service diffused a new idea, causing a change in billions of address records in thousands of databases. How? First, it was a game-changing innovation. Zip+4 makes it far easier for marketers to target neighborhoods and much faster and easier to deliver the mail. The product was a Purple Cow, completely changing the way customers and the Postal Service would deal with bulk mail. Zip+4 offered both dramatically increased speed in delivery and significantly lower costs for bulk mailers. These benefits made it worth the time it took for big mailers to pay attention. The cost of ignoring the innovation would be felt immediately on the bottom line. Second, the Postal Service wisely singled out a few early adopters. These were organizations that were technically savvy and that were extremely sensitive to both pricing and speed issues. These early adopters were also in a position to sneeze the benefits to other, less astute, mailers. The lesson here is simple: The more intransigent your market, the more crowded the marketplace, the busier your customers, the more you need the Purple Cow. Half-measures will fail. Overhauling the product with dramatic improvements in things that the right customers care about, on the other hand, can have a huge payoff. 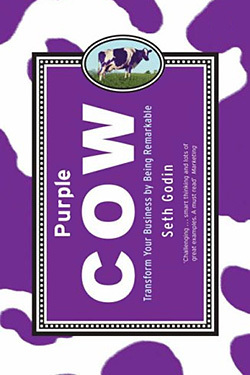 Reprinted by permission from Purple Cow: Transform Your Business by Being Remarkable by Seth Godin (Portfolio).